It's not quite Larry Niven's autodoc, or even a tricorder, but these sfnal devices need to test the patient in a very compact format, so I'm interested in Radisens' Gemini diagnostic tests. Radisens’ Gemini™ platform, which includes myriad nanotechnology breakthroughs, has been realised by our multidisciplinary biochemistry, centrifugal microfluidics, optoelectronics and manufacturing process development teams. This multi-mode approach introduces new paradigms for the diagnosis and monitoring of chronic disease co-morbidity, introducing stepped improvements for the chronic disease management. 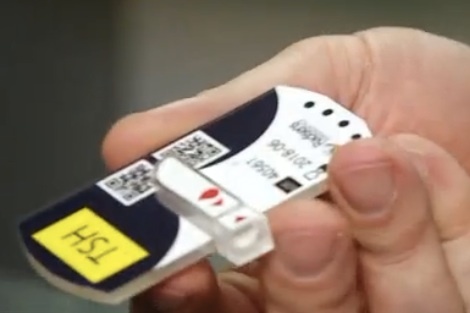 With demonstrated ‘third generation’ performance, a fraction of a blood drop delivers instant diagnostic results. Initial test panels target the diabetes, heart disease, chronic kidney and liver disease clinical pathways. With better than 2pg/ml (TSH) sensitivities, this quantitative diagnostics platform finally brings central laboratory performance to point-of-care settings, without the need for large capital outlay, complex quality assurance or training programmes, or complicated operator protocols. Note that the Gemini device is not self-contained; it must be centrifuged to function and be read.